We glided through the sharp blue water of Lake Titicaca on a small motorboat. Our guide Julio announced that the Uros Islands lay just ahead. My mind pictured a stereotypical sandy beach, but this island looked more like a flattened pile of brown straw. I stepped off the boat. The first thing I noticed was that the ground felt weird to walk on — it was soft, a little squishy and a bit spongy. Imagine walking on a raft made of hay floating in the water. This same sensation greets you on a visit to the Uros Islands of Lake Titicaca in the Andes Mountains of South America straddling the border between Peru and Bolivia. The Uros Islands continue to be a major tourist attraction in the region and for good reason. Where else can the average person visit with descendants of an ancient, indigenous civilization, explore their community and culture, and learn about their nearly lost customs and way of life? And where else can you visit islands made entirely from reeds — islands that float on the surface of Lake Titicaca, the highest navigable lake in the world at 12,500 feet above sea level? In fact, the Uros Islands are currently a top candidate in an online public poll for a spot on the list of the world’s "New 7 Wonders of Nature." The Uros Islands are commonly referred to as the Floating Islands. And, yes, they actually float on the surface of the water because they are man-made entirely of reeds from the totora plant, which grows naturally along the banks of the lake. The reeds decay fairly quickly, so the top reeds are constantly being replaced with new ones. An island lasts up to 30 years before having to be built from scratch. While the islands float, ropes fastened to stakes deep in the lake bed anchor them in place. The descendants of the Uros Indian tribe live on the islands and create and maintain them. 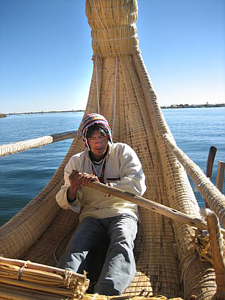 The primitive Uros Indians are an ancient society that predates even the Incas. They lived on the land around Lake Titicaca until the 13th century, but resourcefully moved to the lake, initially to escape the Incas and later the Spaniards who took over the region. There are about 40 islands with approximately 2,000 inhabitants. Typically two to 10 families live on an island depending on its size. During a visit to the Uros Islands, you can interact with and talk to the resident Uros (with your guide translating unless you speak Aymara) and learn how they weave reeds to make the islands. You can check out their mini reed island of guinea pigs (also known as future meals) and observe a cooking demonstration. A typical meal involves placing a small lake fish between two hot stones. You can even taste a totora reed. A trip to the islands also allows you to visit reed homes, ride on a reed boat, and even stay the night in your own reed guest hut. And if it seems like reeds rule, they do. 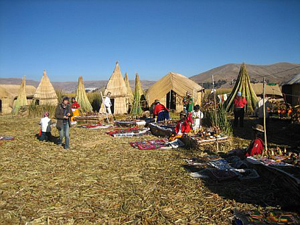 The ubiquitous and versatile totora plant is a fundamental staple in Uros society. They use the reeds to build their islands, houses, buildings, furniture and boats, and even eat the raw reeds with most meals as a side dish. You can get to the Uros Islands from Puno, a small Peruvian city on the northeastern shore of Lake Titicaca. Puno is a scenic eight-hour bus ride from Cusco. From the port of Puno, a three-mile motorboat ride transports you to the Uros Islands.